This is the time of year when the days get shorter and the temperatures drop. The hockey season is in full swing and it sometimes feels like there's no end in sight. It can be hard to keep the energy levels up and the enthusiasm high among players, parents and coaches. Here are a few tips to keep your eye on what's important. If you find it hard to drag yourself into the rink and onto the ice for practice, how can you expect your players to be engaged and motivated? We have a few tricks to keep everyone excited about practice. Sometimes we'll pump music over the PA system to get players moving. Or we'll start practice with a small area game to get the competitive juices flowing. Over the course of a long season it's not unusual for players to begin to tune out a coach. Try turning a practice over to one of your assistant coaches, or perhaps bring in a guest coach to run a practice. We are all guilty of relying on our favorite tried-and-true drills to work on specific skills. A coach should not lose sight of the importance of continuing to promote skill development, but mixing in different drills and small area games with new objectives can go a long way to keeping players engaged. Most coaches kick off the season with a parents' meeting to lay down a few ground rules, discuss philosophies and map out a course for the season. That's all well and good when the season is young and everyone is refreshed and ready to go. Keep the lines of communication open throughout the course of the season with regular meetings and weekly emails so you can discuss issues that may pop up from time to time. Take advantage of the holidays that take place over the course of the season. We'll host various events to correspond with holidays such as Halloween, Thanksgiving, Christmas and the New Year. 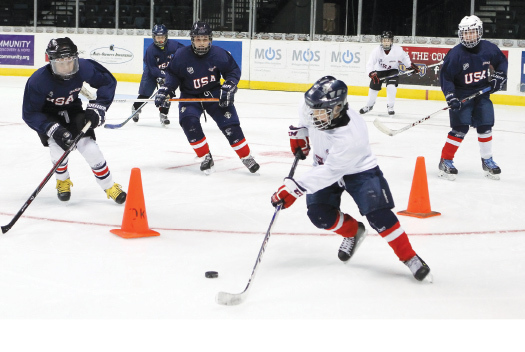 It can take a little extra effort, but the same team effort you expect of your players on the ice can be beneficial off the ice if parents are willing to get involved. The learning doesn't stop on the ice. Over the course of the year we'll bring in guest speakers such as police or firemen, military service members or other professionals to talk to our players about things that are not directly related to the Xs and Os of the game. It's easy to get caught up on the scoreboard and standings, especially with the playoffs just around the corner. It's important to remember to enjoy the journey and focus on the friendships that will last long after the final game is played.